This homemade compost bin is a fun way to teach kids about helping the environment while also helping your own garden. It's easy and cheap (two key words :) ) and will provide your garden with lots of great nutrients! If your feeling creative decorate the bin with craft paint. Drill a series of holes along the bottom of the bin about 1 centimeter wide and 3 centimeters apart and also on the sides. Under the bin cut a hole 1 centimeter wide and 3 centimeters long in two opposite corners. These holes allow ventilation for the compost. Next, decorate your bin with craft paints and allow to dry completely (if desired). When the bin is dry it's time to fill! Start with a few inches of potting soil. Next you can begin lining your bin with compost. Use items such as newspaper, vegetable scraps, potato clippings, fruit peelings and scraps, grass clippings, hay and leaves. Beware of adding meat, dairy products, fish and bones as they will only attract animals and they take much longer to decompose. Be sure to keep your compost moist adding water if needed. Your compost should be ready to use in approximately 3 - 4 weeks depending on the material you have used for your compost. Use composted soil in your garden for added nutrients! This is just what we are looking for! Commercial composters are super expensive! Just one question though. What do you mean cutting a hole under the bin? In the lid? 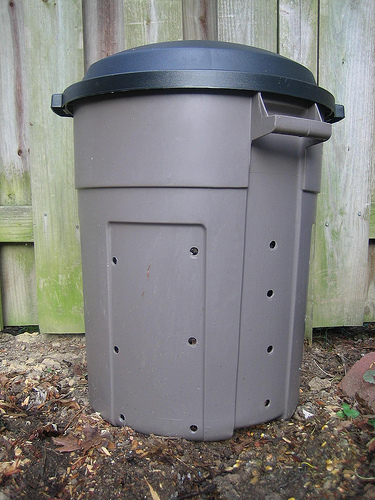 I have seen this simple composter on other sites. It can also be laid on it's side and rolled every three days or so to mix the ingredients...speeds up the process. YES i made one from a 2 wheeled trash can for couple of reason i can turn it and roll it to mix the compost i rent and canoe do a compost pile in the yard and with it being on wheels i can keep it by the kitchen door and wheel it to the containers and raised beds i have in place in the front n back yard and sides of the property.